Designed for the seriously fun golfer, The Woodworth Collection features performance fabrics combined with sportswear technology in your favorite Loudmouth patterns. Loudmouth Golf, the worldwide leader in bold and bright golf and sports fan apparel, is setting a new standard for performance golf wear with the introduction of their new clothing line, The Woodworth Collection. Made from meticulously sourced high-quality fabrics, combined with innovative sportswear technologies and craftsmanship, this collection features a modern fit that is comfortable and breathable for the stylish and fun-loving golfer. The Woodworth Collection features the patented TekFIT® waistband. TekFIT® offers 1-2" of invisible stretch by using a patented compaction and fusing technology, giving you a custom fit with continuous stretch and recovery. TekFIT waistband also features a gripper to keep your tops neatly tucked in for all 19 holes. The Woodworth Collection bottoms are made with stretch-tech poly fabric offering moisture control for optimal comfort. In addition to being fade resistant, these bottoms also offer the convenience of an anti-wrinkle and shrink-free garment making them perfect to pack for golf trips and vacations. "Many of our customers love the feel of cotton. But others requested a modern care-free poly. So we developed a virtually bulletproof pant that will look as good in 25 years as they do today,” says Loudmouth Founder & Designer, Woody. “They are a high quality product, and well worth the investment. Imagine the joy on your son's face when you pass down these beauties!" The Woodworth Collection is now available for men in pants and shorts; And women’s skorts. 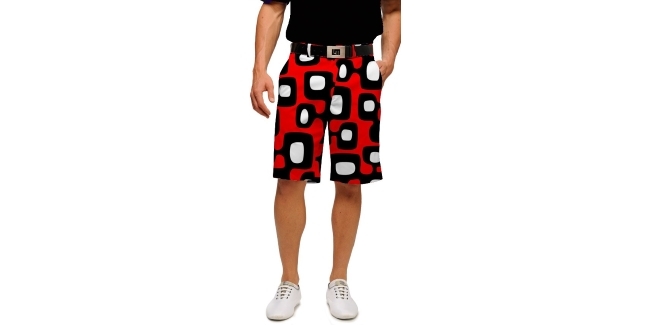 New and classic Loudmouth patterns available include: Shagadelic White, Stars & Stripes, and Flagadelic. In addition, two new patterns will be added to the collection later this summer, Particle Accelerator and Lava Flow.